This is my 3rd installation of my internal discussion of absolute truth and relativism. See part 1 here. I was listening to NPR the other day. There was a story that they were discussing about the terrorist attacks on the Pentagon and how the attack affected the structure and function of the Pentagon. They commentators were discussing the various safety features that have been added to the Pentagon in preparation for other such incidents. One of these safety features was to install the FIRE EXIT signs near the floor. The reason is obvious. When there is a fire both heat and smoke rise. The problem is that the FIRE EXIT signs were obscured. No one could see them because of the fire and smoke! No one knew where the exits were! Now how does this relate to truth, absolutes and relativism you ask? In part 1, I ended with many questions of how absolute truth and relativism are balanced? These are some questions that pop into my head. How does the tension between absolute truth and relativism be held in a manner of Love? Has relativism (the believing of whatever is right to you is your truth) surpassed any absolute truth in this postmodern, do as you want age? I know I need to learn to listen and dialogue and discuss, yet aren’t there things and ways that are just wrong? 1. Life is not clear. I live more in midst of fire and smoke than in peace and clarity. This makes me realize one thing. I need to approach the living of life much akin to a desperate man struggling to find an exit in a smoke filled room. This makes me fall on my knees, struggling for my next breath, grappling with the questions and circumstances the best way I know how. Struggling not for answers, but for LIFE. 2. I relate any ‘answers’ or ‘exits’ as only they relate to life. In my state of constant desperation and unsurety I am in desperate need for life. Answers or exits only exist to propel me to life. 3. My exit or answer, does not preclude that there are not other exits or answers out there. It just means that this exit is the one I have found and hope to alert all others too. Using our present analogy, imagine if in the midst of a burning building I would proclaim that all the people in the building must exit through the exit I had found. That would be audacious to the say the least and likely disastrous to those that would heed my direction. The reality of many exits does not mean that I would not be yelling ‘FIRE’ and urging all I know to leave. The method of escape is relative to each’s position, but the reality of the fire is absolute. 4. There are paths which I go down that are not exits, but dead ends. Dead ends that led to death, isolation and away from life. It would be irresponsible of me not to declare those paths of death as being death. For example, war is not better than peace, hate is not better than love. There are better ways. How I communicate these things is as important or maybe more important than what I am communicating. 5. True love is not abandoning people when they chose dead end exits. Knowing that whatever path you choose I will always be calling your name. I will wait for you, even though it may cost me my very life. This may even require me to come after you. Requiring me to walk into dark, dead end spaces myself to bring LIFE. 6. I can never, ever, ever forget that I exist in this smoke filled room. It is hard to breath, never mind live. Every moment is a struggle for survival. This means I will falter and fail and I will stumble down dead end corridors. When this happens, the last thing I need is for my friends to be yelling down the hall “I told you so”. Life is critical enough, let’s not add to it’s chorus. I apologize if I have taken this analogy to it’s utter limits. Pictures speak loudly for me. Please add any other thoughts or pictures that you have seen that help describe the tension between absolutism and relativism. This is a continuing journey and I believe a very important discussion in our current age. 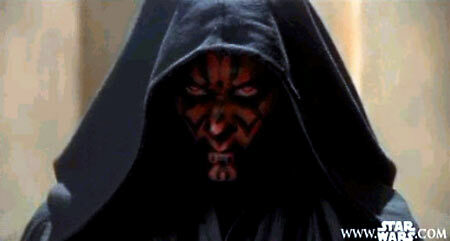 Hello, my name is Kevin, and I am an ex-Sith Lord. A little background… I have been watching the Star Wars series with my eight year old son as he is a Star Wars fanactic. I myself have never watched Star Wars before. Yes, I know that is weird. But I haven’t watched ET or Titanic either. Not that I don’t watch movies, cause I do, just never got to see these. Wow, cut me with a light saber! Only a Sith Lord deals in absolutes. Absolutes, right and wrong clearly these are things to be valued, cherished and extoled. I went to 4 years of Bible School and Theological training to equip me with what is the right view on everything. I had an absolute and right view on everything. You name it. I had an answer. And of course my answer was the right answers, absolutely! I realize now that I had graduated, not a heart of love and grace, but with a mind that measured everything. I had traded in my cap and gown for a measuring stick, a ruler. Instead of the Word of God becoming a beautiful story that depicts a story of a lover after a beautiful bride, it became the measuring stick of how I measured everything and everyone. Not to mention that walking through life while carrying a measuring stick is just plain difficult. (I realized that my tool for measurement had become a cane, to beat those who did not agree with the ‘right and abosolute’ into complete and absolute submission. Crazy thing with measuring sticks or beating canes (whatever vernacular you want to use). They are extremely productive. Trouble is that when you begin to use the tool of absolutism and ‘being right’ you end up beating up a lot of innocent people. I had become a dark Sith Lord, only dealing with absolutes. Dialogue, discussion, hearing, listening and reasoning… why stand on that defenseless ground. My past experiences, which I wish could be just chalked up to a bad dream, are littered with statements of “If you are not with me you are against me.” And of course I knew that god was on my side. So you are not only against me, but you are against God. Deal with that! So this is what I see. I see a past of bruised and battered people. People who held different positions and thoughts than I did. Most of these people were honest, God loving and God fearing people who were struggling with their faith and trying to articulate in the best way they knew how. So I need to say, I am sorry. Sorry to all of those who I haven’t agreed with. I chose disagreement over relationship, I chose being right with being love, I chose speaking over hearing. I chose my things over the things of God. Now I hear all the screaming but…, “if we don’t have absolutes what will stop relativism to sweep over us and force us to accept whatever each of us want to believe.” I wish to talk about this more in Part 2.